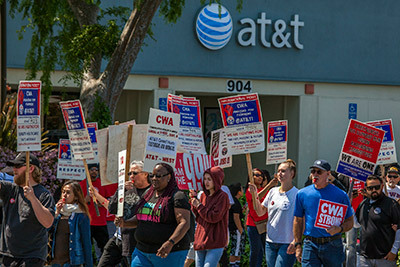 CWA represents more than 150,000 workers at AT&T, including 45,000 at AT&T Mobility nationwide; 9,000 at DIRECTV and 2,000 at AT&T Internet. CWA members work as technicians, customer service and call center representatives, and at retail stores. At the landline part of the company, CWA represents workers at AT&T Midwest (Illinois, Indiana, Michigan, Ohio, Wisconsin); AT&T Southeast (Alabama, Florida, Georgia, Kentucky, Louisiana, Mississippi, North Carolina, South Carolina, Tennessee); AT&T Southwest (Arkansas, Kansas, Missouri, Oklahoma, Texas); AT&T West (California and Nevada), AT&T Legacy, a nationwide unit, and AT&T East. Bargaining for AT&T Corp. (Legacy T) and AT&T Midwest began on March 6, 2018. Tell AT&T to Show Us the Jobs!